M4A is popularly used on Apple devices, which has better quality than MP3. Some programs can support this audio format, but some do not. MP3, however, is supported by most devices and media players, which is more commonly used than M4A. Besides, MP3 format audio file takes less space than M4A audio. Therefore, if you want to listen to M4A audio files on some devices that do not support it, you may desire to convert M4A to MP3. Although the M4A audio file has better quality and smaller size than MP3 files, sometimes you can not open it on computer. In that case, you can convert M4A to MP3 file to have a try. Here I would like to display 4 best ways to fix how to convert M4A to MP3 without iTunes. Leawo Video Converter is thought to be the best video and audio converter, which can be used to convert video and audio files efficiently. Its powerful and advanced technology can do you much help to convert M4A files to MP3 without iTunes with only a few minutes and without any quality loss at all. The following simple guidance will show you how to get this work done with this program. Run Leawo Video Converter on your computer and then hit on the “Convert” button on the menu bar to choose the tab of “Add Video” to click on. Thus, you can browse your computer folder to choose the M4A files that you desire to convert. You are also able to drag the M4A audio files to the converter directly. Hit on the drag-down box next to the “Convert” button in the interface and then click on the “Change” tab to call out the “Profile” panel. Thus, you can select “MP3 Audio” under the “Format” menu or search MP3 in the fast searching bar. Go back to the drag-down menu and then hit on “Edit” to set detailed parameters for the output files, such as the Audio Codec, Sample Rate, Bit Rate and Channel. Navigate to the main interface of the software and then hit on the big green “Convert” button. In the sidebar that shows up, you can choose one proper folder for containing the converted MP3 audio files in the “Save to” box. Afterwards, you need to hit on the “Convert” button at the bottom of the sidebar to invoke the converting process. This procedure will take you a few minutes and you just need to wait patiently. The converted MP3 files will be shown in the directory folder after the converting process. 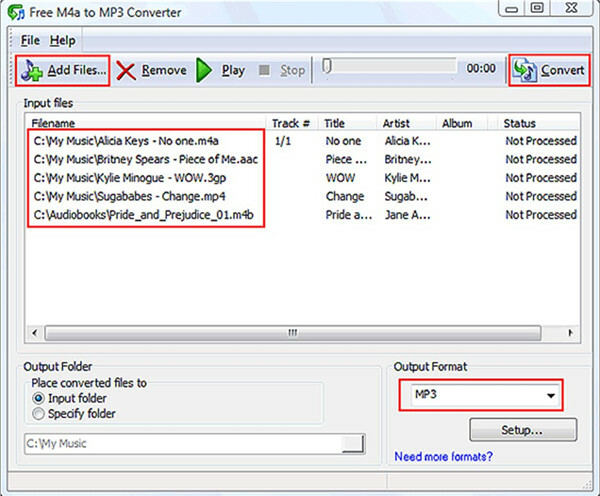 This M4A to MP3 converter is really the most helpful tool that you can take advantage of. You can also use this software to convert M4A audio files to other formats that it supports. 2. Hit on the “Organize” button at the top left of the interface and then choose “Options” tab to click on. 3. 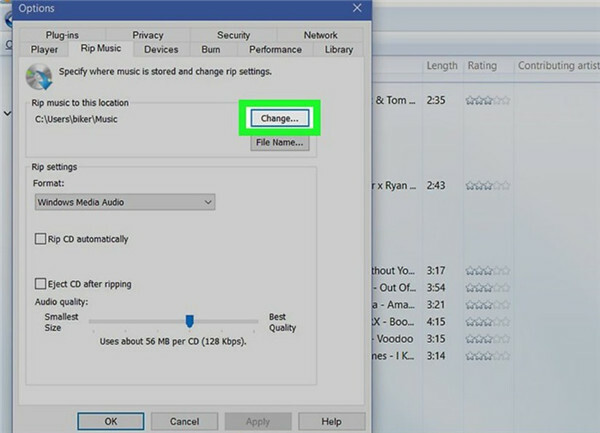 On the panel that shows up, you need to hit on “Rip Music” and then drag down to hit on the “Change” button to choose a proper folder for the converted MP3 files. 4. 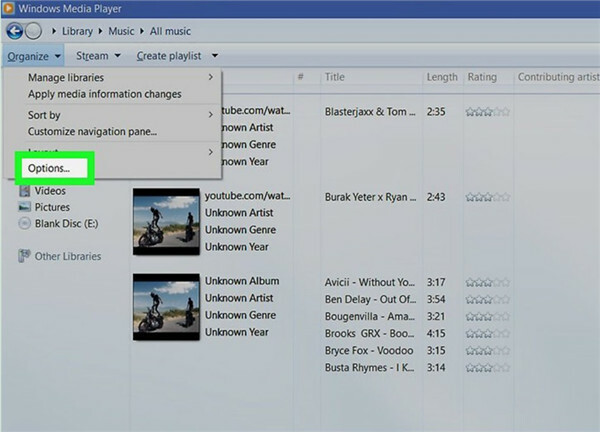 Move to the “Format” area and then click on the box under it to choose “MP3” as the target format via scrolling down. You are also able to set the bit rate for the output MP3 audio files. Click on “OK” button to confirm your settings. It is also a good idea to convert M4A to MP3 Mac without iTunes but via Free M4A to MP3 Converter. This tool is designed to fix this issue, which is not hard for you to handle at all. 1. Kick off Free M4A to MP3 Converter on your computer and then hit on the button of “Add Files” on the toolbar. 2. Click on “Open” tab to browse your computer to choose the M4A audio files that you desire to convert and open them. You can also drag and drop the M4A files into the dialog for converting. 3. From the drop-down menu, you can choose “MP3” as the output format. Afterwards, you need to click on “Convert” button on the toolbar or just press F5 on your keyboard to make it. Thus, you can wait for the termination of the converting process. The converted files will be saved in the default folder on your computer. 4. Besides, you can select the output folder and set the output MP3 quality with this program. These settings are available in the menu of “Options”. This converting tool is not complex for you to apply at all. If you just want to convert M4A to MP3, this single-functional program is quite helpful. When you want to convert M4A to other formats, it will be not helpful. 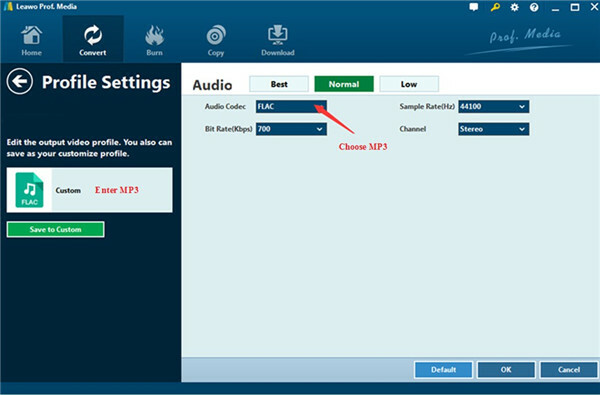 If you do not want to use third-party software to help you to convert M4A to MP3, you can also make use of the online music converter to assist you. Here, I’d like to show you how to use Zamzar to complete this task perfectly. 1. Open a web browser and then navigate to the website of Zamzar. 2. 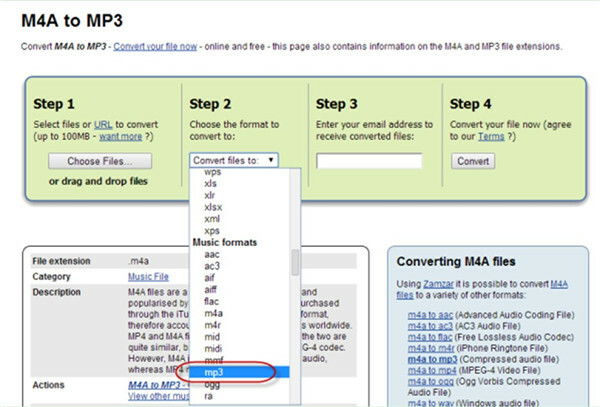 Click on the option of “Choose Files…” and load your M4A audio files into this online converter. 3. 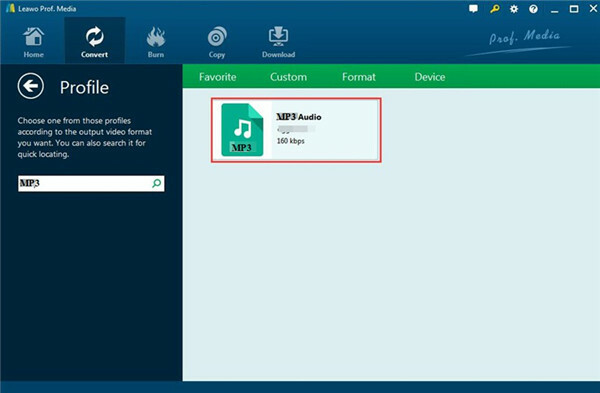 Choose “MP3” as the output format under the menu of “Music Formats”. 4. Type in your email address to receive the converted MP3 files. 5. Hit on the button of “Convert” to begin to convert M4A files to MP3. Remember to read the terms of this website first. This online music converter is quite convenient to use. Even though you are not computer literate, you can use this method to finish the converting task smoothly. The limitation of this website is 100MB. If you desire to convert lots of M4A files in batch, this solution will not be suitable for you to apply. When you have saved many great pieces of music on your computer, you may want to import them to your iPhone for you to enjoy on the go. In order to make it come true, you can resort to Leawo iTransfer, which is one powerful and effective tool for you to use. It can deal with the file transferring among iOS devices, iTunes and computers. The following contents will demonstrate you how to transfer MP3 files to iPhone from computer. You can free download this program to give it a go. Run Leawo iTransfer and then insert iPhone into computer with matched USB cord. 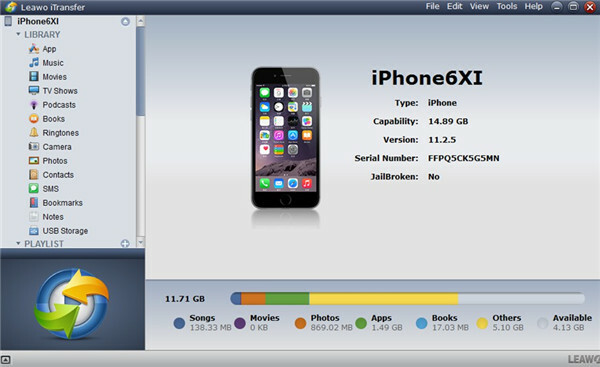 Your iPhone info will be detected by this tool and shown in the right part of the window. Click on the name of your iPhone at the top left of the interface and then hit on the “Music” tab under the menu of “LIBRARY” in the left sidebar to view all songs on your iPhone in the right part of the screen. 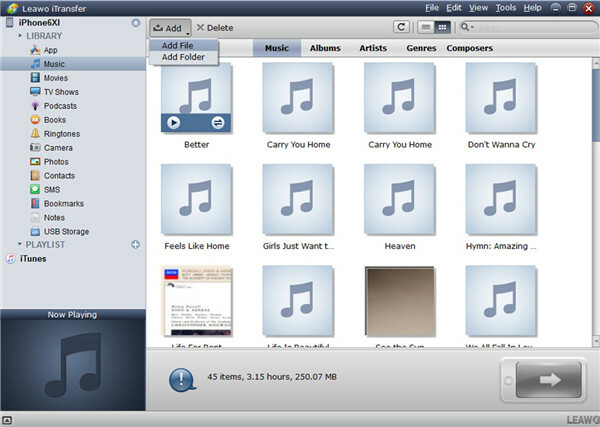 Hit on “Add > Add File” or “Add > Add Folder” tab to choose MP3 files from your computer and import them to your iPhone by clicking on the “Open” button. After you read through this tutorial, you will be able to convert M4A to MP3 files and transfer them to your iPhone for free listening on the go. It is quite a pleasant experience for you to transfer great songs or other files from computer to iPhone or from iPhone to computer for your convenience.